Of course you have to have some ginger honey cookies when you're planning a road trip, but you probably don't want to keep inhaling those while you're driving for almost the whole day! And when the ubiquitous trail mix starts losing appeal and you realize you've been sitting in a metal box hurtling down the freeways for hours and hours, you'll want something a little more refreshing. 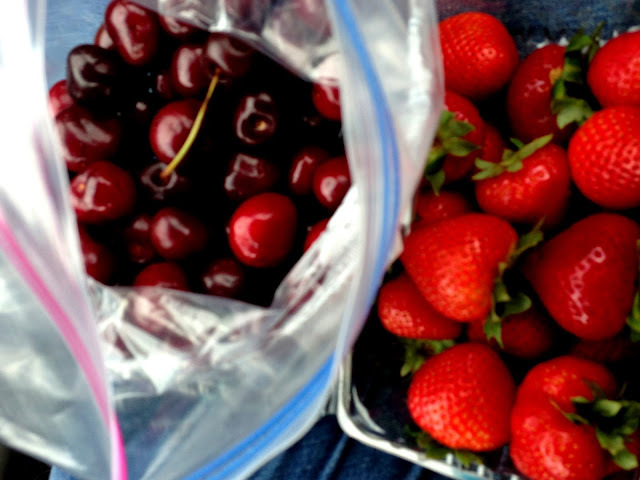 So next time you're planning a summer road trip, be sure to pack a little cooler with washed strawberries (or really any berries) and cherries - and keep a napkin on hand for the pits! P.S. Did you know that strawberries aren't even really considered fruit?! Apparently the little "seeds" are the fruit, and the yummy red flesh is just the delicious "accessory tissue" - who would'a thunk! P.S.2. 50 Rules of Vacation from Dinner a Love Story.